Award Winning Range of products produced on the Jersey Isle, home of some of the most stunning seascapes in the world. Closer to France than Mainland Britain, this small intriguing island boasts some of the cleanest beaches, clearest waters and mildest climate in the British Isles. Local produce and extracts from herbs distilled on the isle feature extensively in each of the key product ranges. Winner of 10 UK Awards! Seascape’s ‘Refresh’ range contains three invigorating products, a Hand & Nail Cream, Hand Wash and Hand Lotion, all you need to care for and keep hands and nails happy. Each of the Refresh products contains 100% natural essential oils specifically selected for their healing and toning properties, such as Lemongrass to tone tired hands; Jersey Lavender for its antiseptic and soothing properties; Shea Butter nourishes and the sweet floral scent of Geranium to bring a relaxing element to the mix. These 100% British products contain all-natural ingredients, sourced and manufactured in the UK. The Refresh products are sold individually or as a gift set. 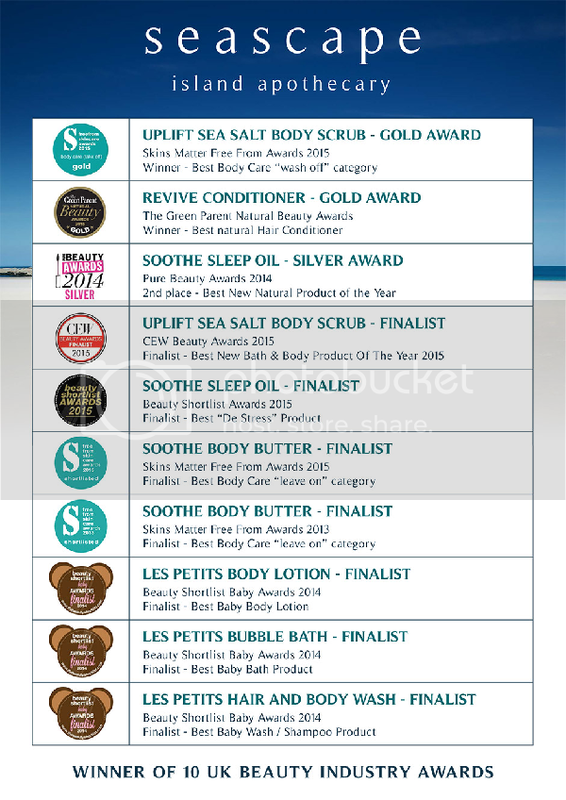 Seascape’s ‘Soothe’ range contains two of their award winning products, the Sleep Oil known as “A Lullaby in a Bottle” and their Body Butter, the richest, thickest Body Butter ever, a little goes a very long way. Also in the range is a fragrant Body Wash and light calming Body Mist. The Soothe range is pregnancy safe and the most indulgent of all the Seascape products;containing delicious oils and scents including Ylang Ylang, Jersey Beeswax and Honey, both Shea and Cocoa Butter, Rosehip and Grape Seed Oil, Sweet Almond Oil and evocative Jersey Lavender. All Seascape products contain 100% natural ingredients, each with specific aromatherapy benefits. The products in the Soothe range are designed to smooth the skin and calm the mind. Seascape’s ‘Unwind’ range contains three pregnancy safe products, produced to help relax the body and calm the mind; including a Body Wash, Foam Bath and Body Lotion. Each of the Unwind products contains 100% natural essential oils specifically selected to induce a feeling of peaceful tranquillity such as Jersey Lavender and Ylang Ylang. These 100% British products contain all-natural ingredients, sourced and manufactured in the UK. Seascape’s ‘Uplift’ range includes their award winning Sea Salt Body Scrub, plus a Body Wash and Body Lotion. All three products are infused with 100% natural ingredients including: Energising Jersey Eucalyptus; Zesty Lime plus Lavender for clarity of mind. As with all Seascape products, a little goes a long way, this is especially true of the Salt Scrub, use in conjunction with the Body Wash and follow with the Body Lotion for maximum effect. This leaves skin feeling soft and smooth and mind calm, clear and energised, a form of affordable aromatherapy. The Body Wash and Body Lotion can also be purchased as a gift set. Seascape’s ‘Homme’ range contains three products, produced for men, a Shave Gel, Daily Moisturiser and Body Wash. Each product contains 100% natural essential oils specifically selected to facilitate a smooth shave, repair dry, damaged skin, and a Body Wash that lifts the spirits and enlivens the mind. These 100% British products contain all-natural ingredients that have been sourced in the UK, including Aloe Vera to cool and calm skin when shaving, Jersey Lavender and Shea Butter to moisturise dehydrated skin and Eucalyptus, Ginger and Lime to add vibrancy to the daily shower. The Homme products are sold individually or as a gift set. Contains 100% natural essential oils of Jersey Rosemary to stimulate and repair and bergamot to cleanse and condition the hair and scalp. Suitable for all hair types.